These are the words that greeted my son Paddy and his partner, Nicola, as they ventured into the dining-room for their breakfast in Ambleside in the Lake District. Nicola, a brilliant photographer, has written and snapped her favourite bits of their weekend for me to put on our blog. Enjoy. “When Paddy and I realised we had a kid-free weekend coming up it dawned on us that we could sneak off for the weekend and visit some of the beautiful country we live in. I left Paddy to search the Internet and find somewhere nice and his search took him to Ambleside. I’ve only been once before and that was only a flying visit. …… and I immediately began poring over the images of the rooms wondering which one we’d be staying in. Friday came and to be honest it was a terrible day at work, which made the prospect of going away all the more exciting. With Archie in Wales with my dad, Freddie in his ‘doggy hotel’ for the weekend and Emily safely deposited at my sister’s we headed to the Lakes. 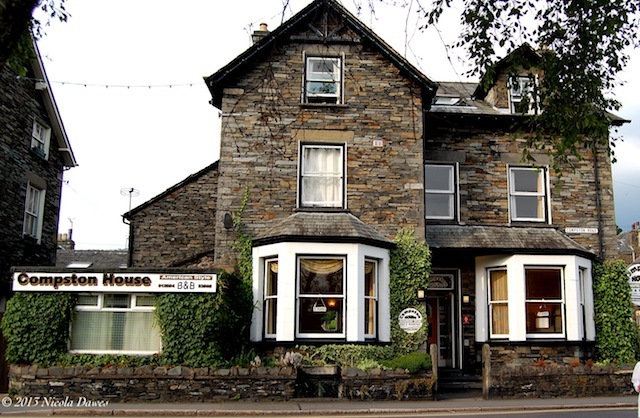 Three hours later we arrived in Ambleside and turned a corner to find Compston House waiting for us, a beautiful large Victorian slate house. We were given such a warm welcome by the owners Sue and Jerry. Sue ran through the parking, keys and house rules and showed us to our room. Each room is named after a different State in America and ours was Texas. I loved the sign in the bathroom that said “Don’t mess with Texas”. The room came complete with cowboy hat, neckerchief and suede cushions and bed runner. It was well equipped with useful things too, tea and coffee making facilities, a modern tv with sky and free wifi. There was even a hair dryer – typical, since for once I had remembered to bring mine. Sue had recommended a Thai restaurant nearby for our evening meal and had provided us with a 10% discount voucher. The place was packed when we turned up without a booking but they were able to sort us a table for an hour later so we tested out one of the local pubs while we waited. The Thai restaurant was great and the owner there was lovely and very welcoming too, she even sorted out my curry when it a bit too hot for me. 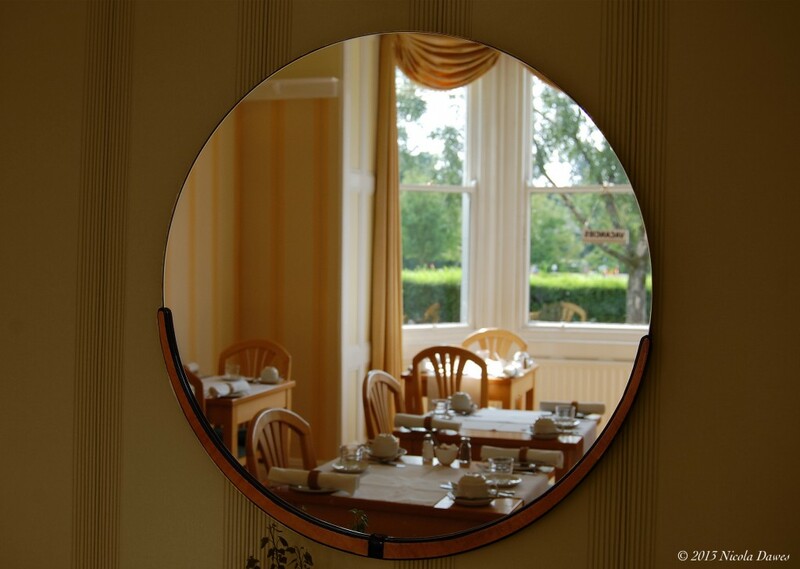 What Breakfast delights greet us through the round window? Anyway, back to the B&B. Saturday morning we got up, tummies rumbling in anticipation, and headed down to breakfast, which was served in a lovely sunny dining room by a very attentive Jerry. Sue does the cooking and Jerry made sure we have everything we could possibly need. 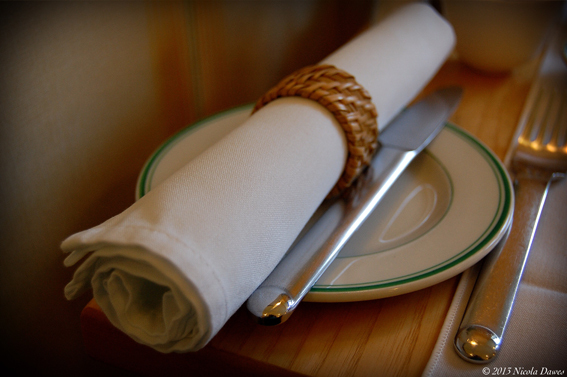 Crisp, white napkins- what a good start! Greeted with a glass of orange juice, provided with huge amounts of tea and coffee, toast and marmalade, and offered yogurt, cereal and fruit (which we politely declined – in anticipation of our Full American Breakfast). There was every attention to detail with the neatly laid tables and crisp, white napkins. “Would ya like pancakes with that?” The question was asked as we both ordered a Full American which consisted of egg, bacon, sausage, hash brown and pancakes. 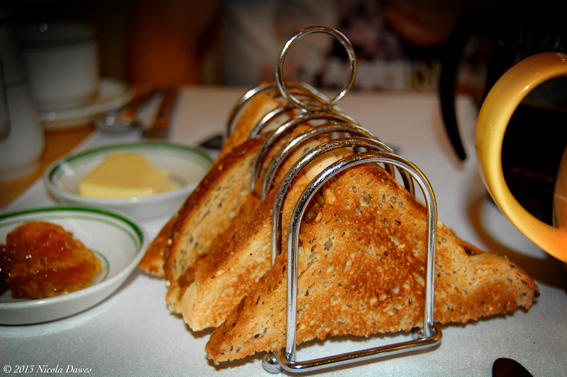 “Oh yes please,” we uttered, nodding in anticipation. You can tell Sue and Jerry are proud of their breakfasts, no expense seemed to be spared on free range eggs, bacon and sausages sourced from a local butcher and freshly made, fluffy pancakes with good quality maple syrup. Nothing was too much trouble, even when Paddy asked for more bacon to have with his pancakes. And I even managed to find room for one of Sue’s lovely homemade Blueberry Muffins offered to every guest on a Sunday as a special treat. 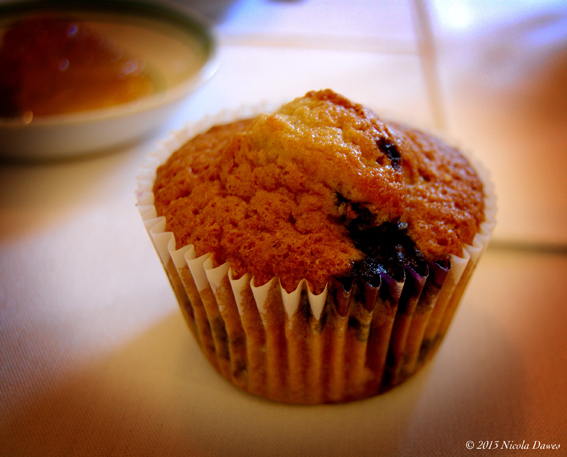 Couldn’t you just eat one of Sue’s Blueberry Muffins? We had a fabulous time, made so much better by Sue and Jerry’s great hospitality, comfortable rooms and fantastic cooking. 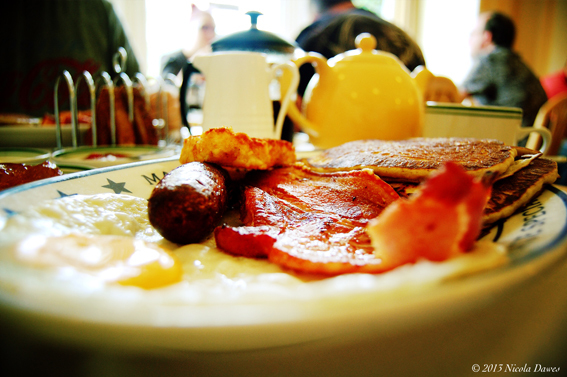 It really is no surprise that they have gained the Visit England Breakfast Award four years running! Well, I’m thrilled to read what a good weekend Paddy and Nicola had in the Lakes. Compston House sounds an amazing Bed & Breakfast, and if Nicola’s fabulous photos are anything to go by, the food looks brilliant. 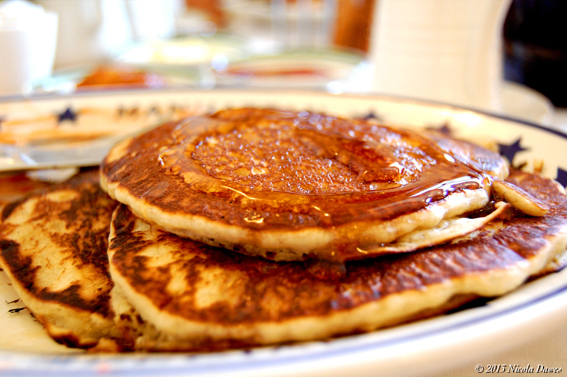 It is making me very hungry just looking at the Full American Breakfast and the Pancakes. “Would ya like pancakes with that?”. I definitely would, anytime, as they look so good in the picture. Time to get dressed and go and find something to eat to stop my tummy rumbling. Hope you enjoyed Nicola’s review.